Recently I got my Marino 26" frames back. (I have two identical frames, one in blue and one in red). The blue one is the fun build, so here it is. I'll update this thread as I make some changes to it. Geo is 1060, +80, 377, with a 73 degree headtube. Reach is 680. Either you think I'm crazy and the geo is just dumb, or you look at the numbers and think "hey, that sounds like a lot of fun." The long reach allowed me to go with a 130mm stem right off the bat and felt good. The goal is to have something that is more flickable and fun than normal modern pure bikes that still feels decent on rear wheel moves. The shorter wheelbase and slightly shorter chainstay make this manual nicely (not that I know how). I've got to work up some confidence on bigger rolling bunnyhops, but it should be nice. With the super high BB it still does rear moves and sidehops decently with the bars rolled back into a less visually oppressive angle. I liked the idea of MTB cranks and a hope hub on a pure bike. It took a bit more modification / grinding than I would've liked to get the cranks to work. Having the rim brake slave cylinders made the clearance super difficult and I had to sand the pads down to almost nothing and take about 1mm off the back of the drive side crank. At some point when I have some more funds, I may try a boost crank made for a 83mm bb. But so far this setup is AMAZING! It feels so stiff. Front Magura MT7 and rear Trialtech are a super nice combo. The Magura is working like crap since I moved it over, the disc mount must be at a slightly different angle or something. So far the rear trialtech Carthy rim is pretty nice! I love not seeing cutouts and it feels super stiff. The coust pads on it are a amazing. The rear heatsink tensioner is a bit sloppy looking. Originally Marino said he'd be able to fabricate a crewkerz style mount, but then wasn't able to figure it out in the end. Maybe at some point I'll weld one on myself (bonus of steel). Due to the gear ratio on this, there is just a lot of slack to take up. Maybe using a half link would help. I can put a hanger on it and just go with an old school two wheel tensioner too. At some point I will go rear tubeless on this bike. But right not it is fairly cold and my tires just feel like crap no matter what so I'm not stressing it. Tire clearance is a bit of an issue, I had to trim a couple center knobs a mm or two to get it to stop rubbing. The Inspired Arcade bars look incredible, but I am going to try my Crewkerz bars on my next ride. Between the 73 degree head angle and the streety bars, the front end felt so different it was hard to get used to. It seems like this was a phase that has died. Anybody still rocking 24" pure? Seriously Jealous of that Ashton! 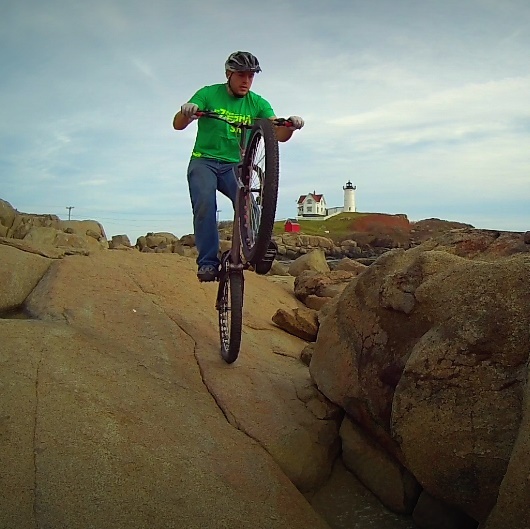 Yeah, when I rode 24" pure awhile back it seemed great for static moves like gaps and sidehops. However I could never really figure out pedal ups, it seemed like neither 20" or 26" technique quite worked super well on it. Obviously some riders like Joe Maher didn't have the same problem. Good to hear, you always rocked 24"!!! You sold the echo?! Are you riding 26" now? Yeah, part of what prompted me to start the thread was checking out Tartybikes and seeing only the Gu and the Jitsie. At least here in the states it seems 24" pure was most popular with beginners, to whom the "best of both" worlds idea was very inviting. I do feel like the Jitsie hybrid has a place, how many old school riders complain about the new bikes being too "xyz", but still can't get on with a completely street bike? It'll be interesting to see how it does. Hey all. I was curious, how far do most of you commute for normal every day rides? Most of my local riding is either mediocre or requires constantly moving ahead of security. So far my search for a decent local practice spot has been unsuccessful. But there is some amazing riding a few hours away... For those rare occasions I can get away. What about you guys? First off, I understand most of the current forks are meant to have a bit of flex in them. When I sidehop I pin my front wheel first and then push in the rear. After landing I am typically looking right behind my front wheel. When I pick up my wheels to let them settle a bit my front wheel shoots forward fairly significantly from all the fork flex, maybe an inch or a bit more? (verified as a LOT by my buddy lance I rode with yesterday). Is this just normal these days? I'm riding an 2018 echo urban. 1 1/8" steerer. Sadly when I got my Marino made I didn't get a tapered fork. I am 100kg, so maybe I should replace my fork anyway. Which version of the HS33 are you using? Any of the aftermarket ones will be way better than the current HS33 levers. Currently I'm using the Trialtech levers and quite happy with them. The clean and Jitsie should also be good as well. TRA's 24 came to mind before I even scrolled down enough to read you listed it. I owned one very similar and somehow I wasn't magically a better rider. Rowan Johns Ashton. All time favorite rider and bike. I have never seen an Ashton justice in person. Has anyone used these for trials? Just curious if the sole was sticky enough for trials. Some of the reviews I read said is wasn't as soft as some of the other "stealth" compounds. After injuring my ankle I want to wear some sort of high top all the time and this is the only one I can really find. I'm not a super big fan of the Five Ten's anymore. No one really uses them anymore. I doesn't seem people are catching crossovers like they used to. Hey there! You'd think high tops give substantially more support, but in reality it's fairly marginal. I've been using the Five Ten Line King's for awhile, no complaints. If you're really looking to prevent injury or support a bad ankle you might want to look into braces / wraps / tape etc. Ironically if I was wearing my Line Kings instead of my other shoes in April I might've not busted my achilles simply because the spot that got hit would've been more covered. Considering I paid less for my custom Marino frames than I would for any other new frame, and the quality was spot on, it was worth the wait for me. I always wanted to try different geos and do something custom, but typically the price is astronomical. That being said, I think it would help if he updated his website to reflect the actual time frame. Some days I just throw in the towel and go home. There are those days where nothing seems to work and I'm just gonna get hurt. But some things that help me out are riding with a friend if possible, really taking the time to stretch and warm up and doing anything else that typically gets met out of a funk like music, burning an effigy of the toxic people in your life, stopping at my favorite coffee shop on the way to the ride and such. I have a few places I ride, and when I'm feeling crappy I go to the most relaxing place, somewhere where I won't be dodging security and such. If it's going on every ride for months, might be worth talking to someone about depression or anxiety. It happens. Conceptually it makes a ton of sense! Let's see how it works. Like so many other MTB concepts, even if it works better and is genius, it'll take a fairly large portion of the market to adapt the tech for it to stick more than a year or so. Being as tall as you are the Hex might feel more comfortable.